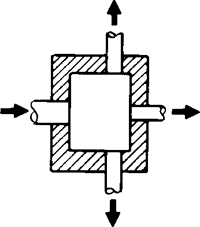 In sanitary engineering, a box in which the flow of effluent from a septic tank is distributed equally into the lines that lead to the absorption field. Retape and mark the ends as you cut the cables to final lengths within the distribution box for hookups (Photo 16). We opened tip the stud space within a few inches of the ceiling and floor to mount the distribution box and to fish the cables (Photo 2). The punch-down markings on the module in the distribution box also can be confusing because the slots are marked with a color but no stripe designation. It's important to ground the distribution box (Photos 13 and 14) before snapping in the telecommunication module. It's up to you to get the lines from the distribution box to the interfaces. 2 SCREW the distribution box to the sides of the studs at a comfortable working height. Use the old writing board as a guide or you can make it a little larger as long as the distribution box closes properly. Your signal distribution box is made of tempered aluminum alloy. Keep a wiring diagram within easy access of each distribution box. If you have any supply or maintenance questions on these boxes, you can contact the signal distribution box expert, Jim Conlon Jr.
Kent Whitney, Vice President at PACE said "The Stacked LNB and Satellite Distribution Box, working together, are very critical for the distribution of entire buildings and is the only feasible choice in the apartment environment to use multiple receivers or to address home theatre applications with multiple outlets. When installed together the SK-0203 Stacked LNB and the LDB-16 Satellite Distribution Box provide for a user friendly installation process.